The crocuses in my garden testify that our long, bitterly cold winter is nearing its end. I hesitate to say it's over, for just as Mark Twain said, "In the Spring I have counted 136 different kinds of weather inside of 24 hours." 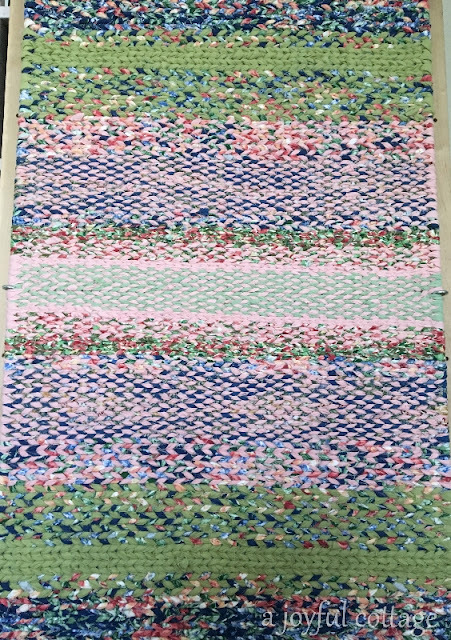 My latest rug is finished and waiting removal from the loom. It reminds me of a spring garden. 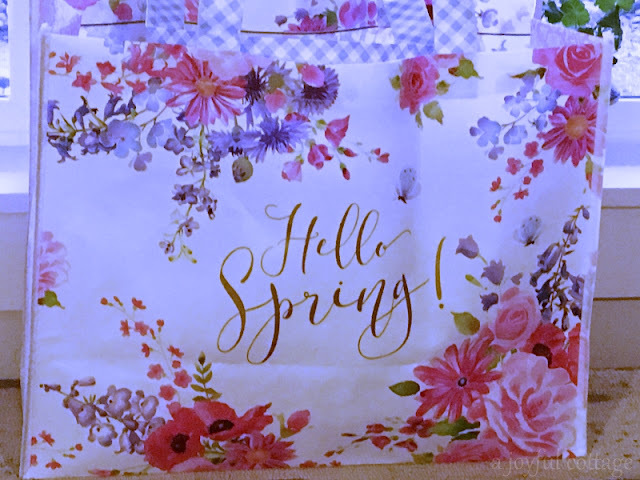 Thank you to Kris of Junk Chic Cottage for hosting the Hello Spring Giveaway. The tote I won expresses perfectly my sentiments this morning (even if it's not yet officially spring). Your rug does look like a Spring Garden - I love it! Nancy - Your flowers and rug are both very "springy" colors. I won one of Kris's bags also - lucky us! Amazing the difference in weather from one side of the US to the other! We are digging out of 3 feet of snow here in the Northeast. We did have a gorgeous, sunny 32 degree day today. It is so pretty with all the clean white snow right now. 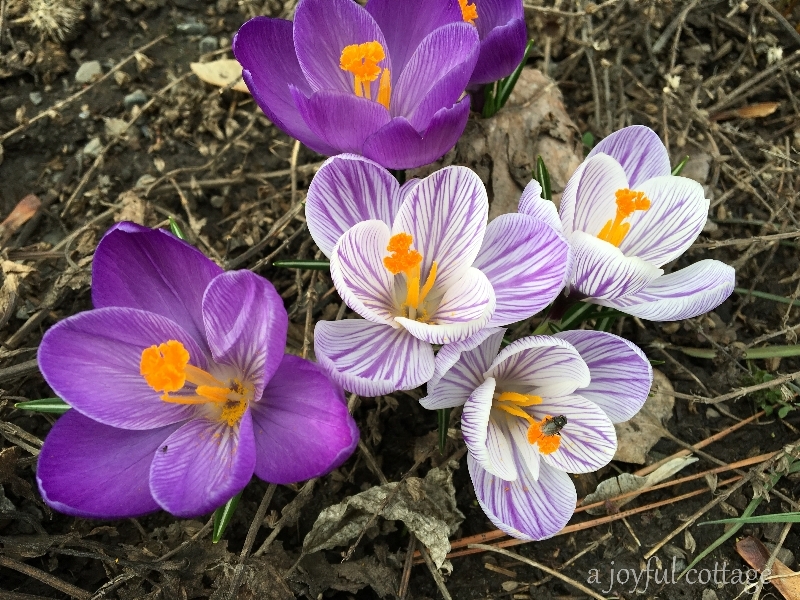 I love when the purple crocuses come up....a sure sign of Spring here too. What a cute tote! Your Rug is really uniquely, BEAUTIFUL!! It does say Spring, just like a Van Gogh painting. Love, LOVE your Spring Garden rug . . . Very, very nice . . .
Also the quotes . . . especially the Shelley . . .
(May I ask, what do you use for your rug weaving . . .
Glad you love your spring bag. Was so happy I could share a few with you wonderful blogging friends. Love love love the rug Nancy. It is beautiful. Happy St. Patrick's Day. Wishing you the luck of the Irish this weekend. The quote by Mark Twain is spot on for our Spring weather in Brittany! 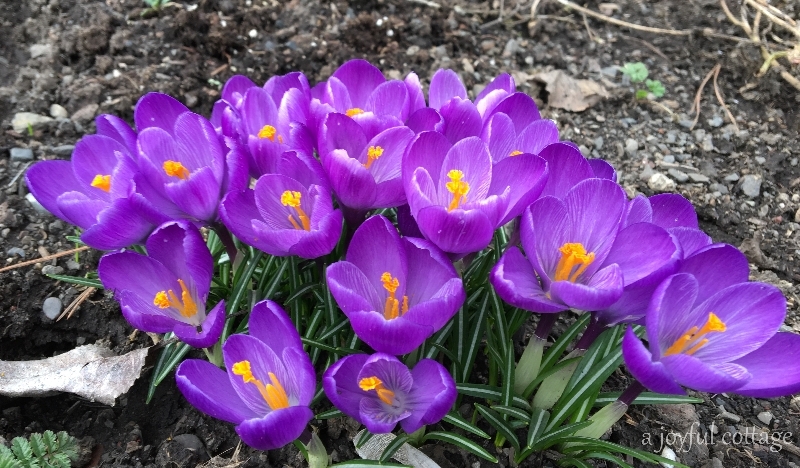 Lovely crocuses! NANCY!!!!!! Your flowers are brave to poke their heads out now! You know, our local weather forecaster said we have seen the last of real winter! We're supposed to hit 60 by Sunday and that' good enough for me in March! Enjoy the colors of the season dear lady! Your rug is gorgeous, Nancy. It definitely reminds me of a spring garden, so full of those lovely, fresh colors. Kris is the sweetest and I hope that bag heralds some warm weather for all of us. I laughed at the Twain quote. So many people are making a big deal about the wacky weather, all the changes, global warming, etc. It's actually comforting to know that March's weather has been wacky for a long, long time!! ;) Happy weekend! I think the rug is beautiful, I enjoy the colors. Nancy, your rug is gorgeous, a perfect cottage rug! A cottage is, to me, the very best sort of house. Jean, your very kind. Thanks so much for visiting. This is a lovely blog. I realy like the rug. I love looking at flowers. I so wish that I could have a garden. But unfortunately my allergies to grass, flowers, trees, and hay all hinder me from having one. Oh, no. I'm so sorry. I can't imagine how frustrating that must be. I hope you can fill your life with beautiful images of flowers and nature. Although it's not the same as having a garden, it does bring pleasure to the soul. Thanks for stopping by. Oh, the rug! And the Pulitzer quote. Living like it's Spring, indeed. Inside AND out! Your rug turned out very nice! I agree with "Living like it's Spring"
Your photos of your spring flowers are gorgeous! Almost as wonderful as seeing them in person. Your new rug is a real work of art and your tote is perfect. Spring is peeking around the corner! I love the rug, Nancy! Wonderful colors. Love the quotes as well and the pretty flowers. Love all around.